↑ Consulate-General of Japan in San Francisco. 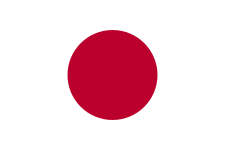 Basic / General Information on Japan; 2008-01-01 [archived 2012-12-11; cited 2009-11-19]. ↑ 5.0 5.1 5.2 Ministry of Defense. Defense Specification Z 8701C (DSPZ8701C) [PDF]; 1973-11-27 [cited 2009-07-09]. (ญี่ปุ่น). ↑ DIC Corporation. DICカラーガイド情報検索 (ver 1.4) [DIC Color Guide Information Retrieval (version 1.4)] [cited 2009-09-15]. (ญี่ปุ่น). ↑ 7.0 7.1 Office of Developmental Assistance. 日章旗のマーク、ODAシンボルマーク [National flag mark, ODA Symbol] [PDF]; 1995-09-01 [archived 2011-09-28; cited 2009-09-06]. (ญี่ปุ่น). ↑ 8.0 8.1 8.2 Find a PANTONE color. Pantone LLC. Pantone Color Picker [cited 2009-12-09]. ↑ 9.0 9.1 du Payrat, Armand (2000). Album des pavillons nationaux et des marques distinctive. France: Service Hydrographique et Océanographique de la Marine. pp. JA 2.1. ISBN 2-11-088247-6. หน้านี้แก้ไขล่าสุดเมื่อวันที่ 27 กุมภาพันธ์ 2562 เวลา 17:40 น.